When Purple Records was first set up in 1971, it was by no means a mere vanity label to release Deep Purple product, from “Machine Head” until the end of the decade; it also set out to nurture and discover raw talent too. The label would eventually become home to debut solo releases from Jon Lord, Roger Glover, David Coverdale and Glenn Hughes, as well as early releases from Yvonne Elliman and Ronnie James Dio with Elf. One of their earliest signings was a hard rock band called Bullet, featuring guitarist John Du Cann and drummer Paul Hammond, both formerly of Atomic Rooster, having played on “Death Walks Behind You” (1970), and “In The Hearing Of” (1971), as well as the hit single ‘The Devil’s Answer’. They were joined by Quatermass bassist John Gustafson. After only one single, they discovered a US band already called Bullet, swiftly changing their name to Hard Stuff. Hard Stuff issued their vinyl debut in 1972, with “Bulletproof”. Kicking off with the single ‘Jay Time’, the album also includes an exclusive co-write with Purple label-mates Ian Gillan and Roger Glover on ‘Monster In Paradise’, originally written for Quatermass. The original 10 track LP is now augmented with the Bullet 45, ‘Hobo’ b/w ‘Sinister Minister’, plus ‘Jay Time’ and the non-album B-Side ‘The Orchestrator’. After touring Europe, unsurprisingly often as support to Deep Purple, Hard Stuff recorded their second platter, “Bolex Dementia”, at A.I.R. Studios and De Lane Lea in Wembley. Taking on a funkier direction than the previous record, “Bolex Dementia” has now been enhanced with the very rare single, ‘Inside Your Life’ b/w (It’s) How You Do It!. 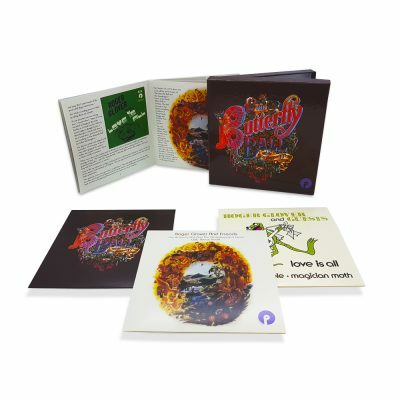 The booklet includes an essay by Classic Rock’s Malcolm Dome, based on interviews with the band’s John Gustafson, and Deep Purple’s Roger Glover.